This year, the University of Oxford’s third French film essay competition was also opened up to younger students (from year 7 onwards) and even offered entrants the chance to write, direct and submit their own mini-film via YouTube. An amazing total of 222 entries were received, from across 42 schools. The judges were deeply impressed by the range and richness of responses to the two set films: Le Hérisson (years 7-11) and L’Auberge Espagnole. Entrants re-wrote the closing chapter, picking up narrative threads left hanging by each film’s ambiguous ending. So rich were the responses that, in addition to the winner and runner-up in each category, a selection of further entries were offered special commendation. The winners in each age group were India Gaer, Marlborough College (Years 7-11) and Eleanor Palmer, St George’s Weybridge (Years 12-13). The rewritings of the ending of Le Hérisson often proved dramatic, in keeping with the shock ending of the film itself: fire destroyed the apartment block in a number of entries. In many cases, Paloma went on to fulfil her plan to commit suicide while Renée and Kakuro were left to grieve; some saw her taking the pills but waking up in hospital reunited with her family. Others saw her opting instead to find her way out of her goldfish bowl by destroying her parents and sister in various imaginative ways. In certain versions, Kakuro Ozu was seen as a potential murderer whose relationship with Renée was more threatening to her than any laundry truck. Those who preferred a happier ending often chose to install Paloma as the adopted daughter of Renée and Kakuro, in some cases sending the trio to Japan to enjoy their future together. Entrants also opted to recount events through the eyes of different characters, sometimes switching between the perspectives of Paloma and Renée, or opting for the viewpoint of a more minor character such as Paloma’s sister Colombe. 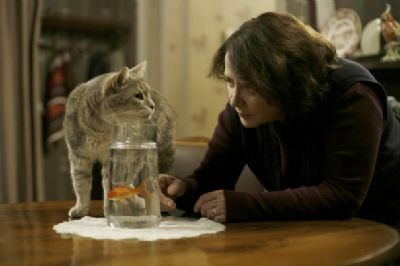 Several entries incorporated creative references to Tolstoy, in keeping with the film’s references to the epigraph to Anna Karenina; a number picked up on the metaphor of the goldfish bowl. Dramatic endings were also dealt out to characters in Barcelona in L’Auberge espagnole, with Xavier rushed to hospital following a car accident in several scripts, perhaps to be met by Jean-Michel refusing to treat him. Entrants variously decided to send Xavier back to Paris, and reunite him with Martine; or have him settle down with Anne-Sophie in Spain. Others focused on recreating dialogue between the flatmates; the character of Will proved popular, with a number of entrants choosing to incorporate him in a series of lively exchanges. Certain motifs of the film, such as the overflowing shared fridge or the shots of the aeroplane featuring Xavier’s voiceover were picked up and explored further. Some enjoyed reflecting the mix of languages reflected in the film; others proved creative in the attention given to music and visuals in their rewritten endings. The judges and co-organisers of the competition are very grateful for the support and assistance of Routes into Languages and the Robert Taylor Society, and look forward to an equally creative response to the films next year.